Clean CARFAX - No accidents - Fully Serviced - QUALITY CERTIFIED up to 10 YEARS 100,000 MILE WARRANTY This Mercedes-Benz includes: REAR SIDE-IMPACT AIRBAGS PREMIUM 1 PKG LUNAR BLUE METALLIC APPEARANCE PKG HEATED FRONT SEATS *Note - For third party subscriptions or services, please contact the dealer for more information. * You appreciate the finer things in life, the vehicle you drive should not be the exception. Style, performance, sophistication is in a class of its own with this stunning Mercedes-Benz E-Class. This AWD-equipped vehicle will handle beautifully on any terrain and in any weather condition your may find yourself in. The benefits of driving an all wheel drive vehicle, such as this Mercedes-Benz E-Class E 350 4MATIC Coupe - Clean CARFAX - No accidents - Fully Serviced - QUALITY CERTIFIED up to 10 YEARS 100,000 MILE WARRANTY, include superior acceleration, improved steering, and increased traction and stability. 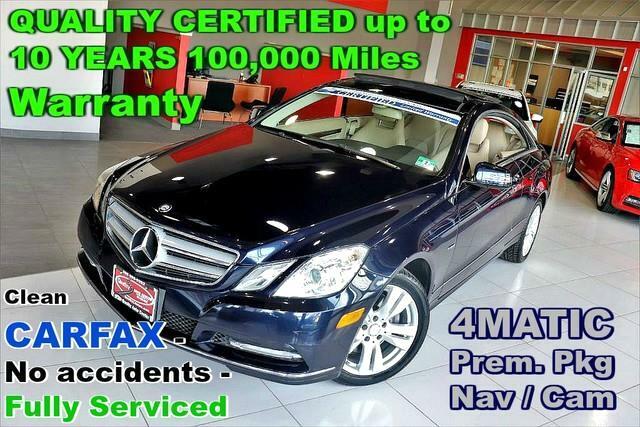 The E-Class E 350 4MATIC Coupe - Clean CARFAX - No accidents - Fully Serviced - QUALITY CERTIFIED up to 10 YEARS 100,000 MILE WARRANTY is well maintained and has just 48,934mi. This low amount of miles makes this vehicle incomparable to the competition. Marked by excellent quality and features with unmistakable refined leather interior that added value and class to the Mercedes-Benz E-Class Knowledge is power and with the complete records of this pre-owned vehicle, you'll have the power to make a wise purchase. This Mercedes-Benz E-Class is beautiful and the interior is clean with virtually no flaws. Fast and exciting, this Mercedes-Benz E-Class E 350 4MATIC Coupe - Clean CARFAX - No accidents - Fully Serviced - QUALITY CERTIFIED up to 10 YEARS 100,000 MILE WARRANTY is a true testament to the pursuit of automotive distinction by Mercedes-Benz. Once you're behind the wheel of this incredible machine, you will not think twice about purchasing this vehicle. Treat yourself to a wonderful driving experience in this wel- optioned Mercedes-Benz E-Class E 350 4MATIC Coupe - Clean CARFAX - No accidents - Fully Serviced - QUALITY CERTIFIED up to 10 YEARS 100,000 MILE WARRANTY. Equipped with the latest in driver comforts, this Mercedes-Benz is the benchmark of modern automotive engineering. Left your phone at the restaurant? No problem. With the navigation system on this Mercedes-Benz E-Class, you'll be able to quickly find your way back to get it. The brand new set of tires means that you will be able to drive off the lot without hesitation. You can drive off in the Mercedes-Benz E-Class E 350 4MATIC Coupe - Clean CARFAX - No accidents - Fully Serviced - QUALITY CERTIFIED up to 10 YEARS 100,000 MILE WARRANTY feeling safe and confident with these new tires. This Mercedes-Benz E-Class E 350 4MATIC Coupe - Clean CARFAX - No accidents - Fully Serviced - QUALITY CERTIFIED up to 10 YEARS 100,000 MILE WARRANTY has a showroom quality finish with no dents or scratches visible. This unbelievably rare Mercedes-Benz E-Class E 350 4MATIC Coupe - Clean CARFAX - No accidents - Fully Serviced - QUALITY CERTIFIED up to 10 YEARS 100,000 MILE WARRANTY is a perfect example of The Best Man Can Build. More information about the 2012 Mercedes-Benz E-Class: The 2012 Mercedes-Benz E-Class aims to provide uncompromised luxury and safety to the midsized car segment. Starting at just under $50,000, the E-Class can be optioned with more safety equipment than any of its competitors. Rear side impact airbags are available in addition to 9 standard airbags but Mercedes-Benz also offers several innovative exclusives such as attention assist and DISTRONIC PLUS, two systems designed to preempt and avoid accidents. Of course none of this comes at the cost of legendary Mercedes-Benz luxury. Available harman/kardon sound system with MP3 support and Dolby 5.1 sound, heated leather seats, night vision assist and a rear view camera are just some of the highlights on an extensive list of optional luxury items available for the E-Class. Strengths of this model include Roomy, luxurious, powerful and safe and available in a variety of body styles from two door convertible to five door wagon. No Credit / Bad Credit / No Paystubs, No problem !! ! All Approved ! Everyone drives ! CLEAN, GORGEOUS, LOW MILES, SHOWROOM CONDITION. CALL NOW QUALITY CERTIFIED up to 10 YEARS 100,000 MILE WARRANTY , To Certify a vehicle, there will be an additional cost for Certification. CALL NOW For details. STUNNING AGGRESSIVE LOOK ON THIS BEAUTIFUL--Call today to schedule a test drive... Good Credit/Bad Credit/No problem!!!! Get paid cash? No problem!! 100% Credit Approval with interest rates starting at 2.49% for qualified customers, our rates will not be beaten. We price our cars at wholesale price to guarantee the best deals for our customers. Our inventory moves quick, please call to confirm the availability of the vehicle of your interest Springfield location 973-564-0112. This vehicle is located at our SPRINGFIELD location. Come visit our new showroom in Springfield NJ. Quality Auto Center has a wide selection of exceptional pre-owned vehicles to choose from, including this 2012 Mercedes-Benz E-Class. Indulge yourself with one of the most highly crafted, most luxurious automobiles available today. When driving an all wheel drive vehicle, such as this Mercedes-Benz E-Class E 350, superior acceleration, traction, and control come standard. You can tell this 2012 Mercedes-Benz E-Class has been pampered by the fact that it has less than 48,934mi and appears with a showroom shine. More information about the 2012 Mercedes-Benz E-Class: The 2012 Mercedes-Benz E-Class aims to provide uncompromised luxury and safety to the midsized car segment. Starting at just under $50,000, the E-Class can be optioned with more safety equipment than any of its competitors. Rear side impact airbags are available in addition to 9 standard airbags but Mercedes-Benz also offers several innovative exclusives such as attention assist and DISTRONIC PLUS, two systems designed to preempt and avoid accidents. Of course none of this comes at the cost of legendary Mercedes-Benz luxury. Available harman/kardon sound system with MP3 support and Dolby 5.1 sound, heated leather seats, night vision assist and a rear view camera are just some of the highlights on an extensive list of optional luxury items available for the E-Class. This model sets itself apart with Roomy, luxurious, powerful and safe and available in a variety of body styles from two door convertible to five door wagon. No Credit / Bad Credit / No Paystubs, No problem !! ! All Approved ! Everyone drives ! CLEAN, GORGEOUS, LOW MILES, SHOWROOM CONDITION. CALL NOW QUALITY CERTIFIED up to 10 YEARS 100,000 MILE WARRANTY , To Certify a vehicle, there will be an additional cost for Certification. CALL NOW For details. STUNNING AGGRESSIVE LOOK ON THIS BEAUTIFUL--Call today to schedule a test drive... Good Credit/Bad Credit/No problem!!!! Get paid cash? No problem!! 100% Credit Approval with interest rates starting at 2.49% for qualified customers, our rates will not be beaten. We price our cars at wholesale price to guarantee the best deals for our customers. Our inventory moves quick, please call to confirm the availability of the vehicle of your interest Springfield location 973-564-0112. This vehicle is located at our SPRINGFIELD location. Come visit our new showroom in Springfield NJ.